This week’s podcast guest is Tuure Pitkänen, a Tampere based Improviser and one of Trent’s first improv students in Finland. 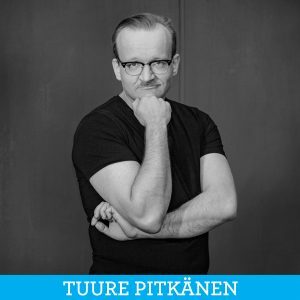 Tuure works as a trainer at an IT company in Tampere, and does improv whenever he has the possibility. He started learning improv about seven years ago, and currently performs with several groups (JadaJada Improv, Korkeapaine) and as a cast member in various improv shows. Tuure is a Finn who started out doing improv in English. Nowadays he performs in Finnish as well. In the episode Trent and Tuure talk about the good old days when Tuure was unemployed and they could spend a lot of time doing comedy together. They also discuss how improv has changed in Finland over the past few years and how Finnish Improv compares to the rest of the European improv community.